Declining upstream costs drove spot propylene prices lower in major markets namely Asia and the US over the past week as per the pricing service of ChemOrbis. However, spot propylene values in Europe managed to hold steady thanks to supply tightness that has persisted in the olefins market for some time now in line with cracker shutdowns across the region. The energy complex has been extremely volatile since the second half of February amidst up and down fluctuations that were followed by consecutive losses in crude oil markets. On the NYMEX, crude oil futures for April deliveries edged up on Friday as they settled up by more than $1/barrel from the beginning of March. But, they were far from erasing the recent drops of the last couple of weeks and still indicated a decrease of more than $3.50/barrel with respect to a month ago. In Europe, ICE Brent crude futures for April deliveries represented a larger fall of around $8/barrel with respect to a month ago, although they posted a tiny gain on Friday and edged up from early March. Relentless losses in energy prices triggered additional drops in spot naphtha markets as well. After seeing four digit highs of around $1050/ton in Europe and $1015/ton in Asia in the middle of February, spot naphtha costs softened by $10/ton both in Asia and Europe week over week. They represented $80/ton decreases with respect to a month ago in both regions. In Asia, spot propylene offers posted drops on a weekly basis due to lower naphtha costs while the bearish trend in the downstream PP market was also said to have contributed to these decreases. Spot propylene prices indicate a $70/ton fall on a weekly basis after softening by another $10/ton on Monday. The latest figures now indicate a cumulative decrease of more than a $100/ton in a month. In the US, spot polymer grade propylene prices retreated by 2.75 cents/lb ( around $60/ton) on DLVD USG basis week over week, bringing the total drop to a massive amount of 9.5 cents/lb ($209/ton) from a month ago. Bearish news also came from the contract market, as March polymer grade propylene contracts were said to be settling down by 6 cents/lb ($132/ton) after they posted increases for six months in a row, according to market sources in the country. 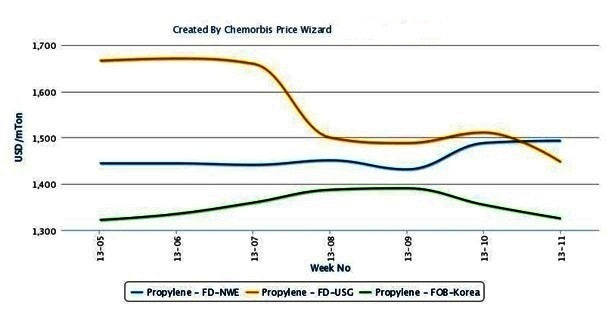 However, despite the persistently weakening upstream chain on a global scale and discouraging activities in the downstream PP market in Europe, spot propylene costs managed to hold steady in this region according to ChemOrbis. 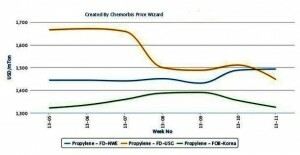 Accordingly, the latest propylene prices edged up on the week, while they showed no change with respect to one month ago. This situation was attributed mainly to tight olefins availability stemming from the ongoing cracker shutdowns across the region. Recently, there are plans to restart at a few crackers though, with Naphthachimie and Repsol resuming production at their crackers. Naphthachimie restarted their 745,000 tons/year cracker, while Repsol restarted their 410,000 tons/year cracker in Portugal in the first week of March, according to industry sources.